Well what most might think there’s another egotistical celebrity/rich man using the Presidential campaign to draw attention to their outlandish notions, it seemed to have worked. Trump has surged ahead of the rest of the Republicans. Makes you wonder as this editorial cartoon ponders what else he might say to our current troops and veterans. I don’t like Trump. I don’t like McCain. I don’t like Hillary. No more Bush’s. It depends on where you live how you fell about the invasion. I know all about the invasion and the crime. can you give me the 5 minute one? Is that a similar feeling to how the native Indians felt when they were invaded? If McCain had stepped on a landmine, this is probably what Trump would have been saying right now. I think we can use The Donald’s own words against him. Trump is everyone’s crazy uncle. I personally won’t be voting for Trump, but yeah people are listening to him. I went political today myself. Yeah, everyone knows there is no way he’ll still be around when it gets serious. This is all free PR. Just like Pat Paulson used to do every year. I would love to have a smart business man in the office. There is no reason this country couldn’t be a profitable power house. I also don’t want a president who has us in a war with every other country in the first 3 months in office. At least Pat Paulson was a known comedian. Trump is different in many ways. What a narcissistic A-hole (Trump not you Bearman) It’s sad that he has gotten this much attention. Sad because of what is says about the American public. I remember Pat Paulson like Gruhn mentioned. But that was different everyone knew he was a comedian. What was this narcissistic A-hole doing while McCain was being tortured as a POW? Good cartoon – upsetting reason behind it though. The weather here in New Hampshire is blow hard hot! They’re all a bunch ah loons! Trump is a moron. But, he does make for good material (for cartoonist at least). 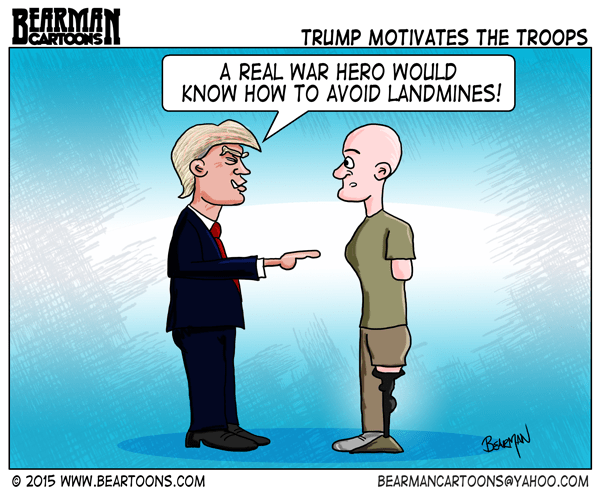 Maybe they should send Trump to Afghanistan so he can demonstrate how it’s done.